Values-based culture is coming into sharp focus for large organizations and small startups alike, particularly when discussions turn to leadership and learning for Millennials. The largest generation in U.S. history at 92 million individuals, Millennials are already having a major impact on the professional world and on society as a whole. They yield great influence, and I would advocate that this is a good thing. Let me tell you why. Millennials are the digital natives. Even the oldest of them have had access to the Internet since they were in high school. Eighty percent are using mobile devices, and 75 percent regularly engage on social media. They are fluent in the language of technology, and as such they are adept at passing on content that they find distracting, inauthentic, or not aligned with their values. Because of their fluency with technology and their ability to quickly hone in on content that speaks to them, they’re looked to by their elders to inform changes and behavior, perhaps more broadly than we’ve seen in modern human history. Goldman Sachs made a nice video about Millennials in the marketplace and their direct and indirect impacts. So, what are the values of Millennials? And how can organizations speak to those values to attract, retain, and foster the best and the brightest of this generation? Based on my research and personal observations, collaboration, learning, openness to change, connectivity, diversity, access, flexibility, autonomy, gratitude, and understanding the meaning and purpose in what they do have all been identified as important values for Millennials. (I’ve provided some links at the end for further reading.) When surveying the trends and behaviors of this generation, we see that this group is optimistic and attracted to liberty and the pursuit of increased well-being and happiness for themselves and others. Millennials don’t just hold these values; they are adept at operationalizing them with the choices they make. Children of the information age, they have access to more information than any other generation has ever had, which, I believe—combined with their youthful confidence—emboldens them and reduces room for doubt. Consider the amount of cross-cultural and cross-ideological awareness an educated person can now have, given the access we have to thought leaders, experts, and philosophers through a variety of sources—TED Talks being a prime example. Millennials who seek this kind of information potentially have the most integrated view of the human story, which would inspire them to draw the circle of who they include as “us” around more of the human population and our natural surroundings. Let’s shift now from how Millennials’ values impact society to what this means in the workplace. Millennials want to work in an environment where they see alignment with their values. They’re concerned about the experience of a workplace they spend significant time in. And, importantly, they have a strong desire for transparency and authenticity in how the organization expresses its values. Here we see the opportunity for companies to identify and communicate their values-based culture. This goes beyond the traditional vision and mission statements, and has the potential for employees (of all generations) to see the alignment of their own personal values and the company’s values. It also provides a clear path for understanding our current state and where that value can be strengthened. Assessments such as those offered by the Barrett Values Centre help companies identify values that align with those of their employees, as well as the presence of “limiting” values that provide areas of opportunity. This type of data, collected through a short survey, can offer a starting point for discussion on how to impact culture in a positive way. As that soul searching progresses and companies wrestle with their meaning and purpose, including, but more importantly beyond, shareholder value, I believe we’ll see a desire and appreciation for truly unique expressions of each organization’s values and how those values are practiced authentically in the culture. While Boomers might have started this movement on some levels and GenXers’ experiments began to build the case for it, Millennials will certainly be the driving force in making values-based cultures the norm in successful organizations. This is where the real opportunity begins. I believe Millennials have a gut-level awareness of their influence and the urge to put their shoulders to the wheel. While many of them are still gaining practical life experience, they’re ready to not only contribute but influence and lead. They’re ready to interject their values into the organizations they are part of, and help the communities they serve move past merely navel-gazing to put those values to work. As a GenXer whose generation moved into leadership roles more reluctantly, I’ve been amazed to see how fully engaged Millennials are. And while they might seek wisdom or life experience from we older bulls, they perceive no meaningful reason why they can’t directly engage the opportunities and challenges they perceive. The HR industry at large is becoming focused on culture and values (see: Bersin by Deloitte’s “10 Predictions to Guide Your Talent Strategy in 2016”), particularly as they recognize the importance of values alignment for Millennials. However, most organizations that are practicing their values in meaningful ways still do not do a great job of communicating this to their customers, and less so to their employees. I believe this represents a great opportunity for companies who want to attract, retain, and foster Millennial workers within their organization. Here at SweetRush, I spearheaded a project to define our values and culture. 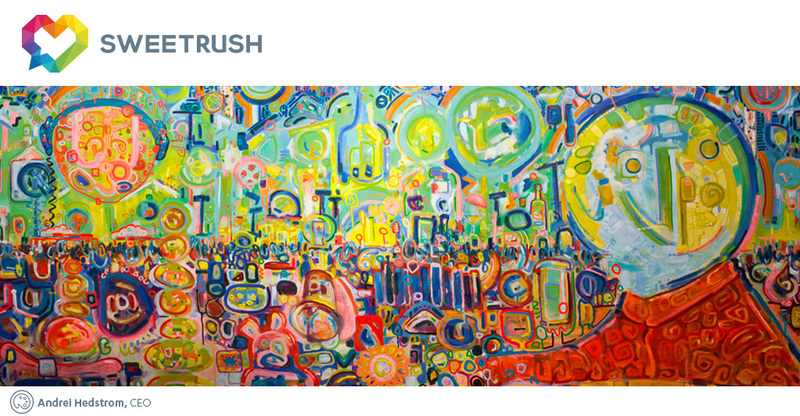 I started in written form, and then gave our team members an open invitation to share their own expressions of SweetRush’s values and culture. The contributions were beautiful, heartfelt, and surprisingly varied: photographs, videos, illustrations, poems, and even recipes were contributed. 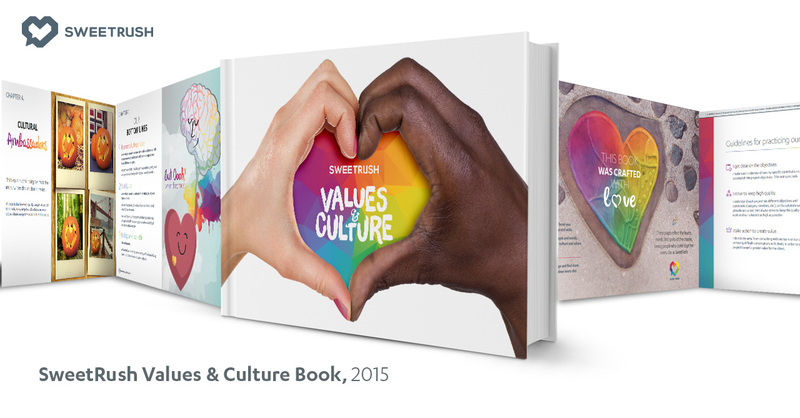 I’m tremendously proud of the result and invite you to take a look at our SweetRush Values & Culture book. This is just one example of how creative you can be with your communications. Below are the important steps that I believe organizations must take to shift in this direction. None of these steps are easy, but I don’t want to water down or sugar coat the moment. To address the various dynamics surrounding Millennials’ influence in the professional world, there’s really heavy lifting to be done. But just because it’s heavy doesn’t mean your organization can’t enjoy the workout as you transform. That said, if this is too much to take on at once, focus on understanding and communicating the first item below. Become a values-based culture focused on a more connected view of our society and planet. Do this from an abundance mindset and not one of scarcity—make the “why” to your business as big as you can muster. Reduce hierarchical structures that create artificial barriers for your team to engage the work of operationalizing those values. Provide as many meaningful, just-in-time learning experiences for your team as you can and plenty of opportunities for learners to socialize these experiences and affect future learning experiences, directly or indirectly. Make it easy for your organization to have authentic discussions about values and practices. Make culture hacking your thing. Make sure you have leaders who care as much about culture as strategy, and don’t be afraid to integrate deeper thinkers and creative types into highly influential positions. With organizations increasingly differentiated by values and cultures, it should not be surprising to find people who have artistic mindsets or even spiritual callings. Come to terms and find some joy in the fact that your organization is going to change—big time! This is a defining moment in many ways for human society. On one hand, we’re facing the negative impacts that large organizations have had on the planet as a whole. On the other hand, we’re starting to become aware of the abundance that can come from identifying and deepening the “why” (the meaning and the purpose) of our efforts. Millennials are at the focal point of this defining moment, with their numbers, technological adeptness, level of education, and desire for authentic alignment of values. This focal point, for those of us who take a broader view of the human story—whether in shaping a successful multigenerational organization or working toward a more sustainable and harmonious world—is one of great importance. I would assert that with this footing in a being-based value meme (as opposed to a subsistence-based meme), Millennials are positioned to offer a significant tipping point for human consciousness, as they challenge the world to practice values that ultimately lead us into a more abundance-minded place. A place in which we see our organizations as unique human parts within a larger and dynamic single planetary community. As the radical disparity between Millennials in industrialized nations and their counterparts in oppressed, marginalized, or impoverished parts of the world becomes more evident, this tipping point becomes a hotbed for organizations to engage the significant challenges our global society faces. Millennials might just be the pioneers of ending some of the biggies like global hunger, human impact on climate and disease, and much more. From a business perspective, for those who can embrace this larger perspective, this spells an almost boundless set of opportunities to activate and engage. Becoming a vibrant organization that does well by doing good is the positive impact that values-based cultures have to offer. For more about Millennials in the workplace, see my colleague Erin Krebs’ post, “Tips for Training Millennials”. I want to say, in a case study of 1 (me) this is absolutely true. I am a bit on the older end of the millennials spectrum but he hit the nail on the head across every point. I really felt like “this dude really gets me”. The result is that I immediately filed this site away for when I am looking for my next job. If you are interested in attracting hardworking young people, take these principles to heart, and figure out how to make them work in your business. I just want to preface that the effort needs to be sincere. I’ll give an example from a past work experience to clarify. I had a job working for a big telecommunications company, that paid decent, but had great potential for advancement. The walls at work were plastered with posters talking about all the correct values, and codes of conduct any company could ever want. My big dilemma is that it was terribly obvious that not a single person in the chain of command actually cared to apply any of them. The only thing that mattered was getting people signed up for more than they wanted (increasing sales), and reducing the cost of maintenance (not delivering on what was sold). The result is that customers were consistently unhappy, and given the opportunity would jump ship in a heartbeat. I found myself in the same boat. When I found the opportunity to work for a company that actually applied their values I jumped ship as fast as I could. Now, the actual realized integrity of a company is one of the most important things I look for whenever I consider working for a company. P.s. SweetRush looks to really practice what Andrei’s preaching here. Just take a look at their leadership team and see what I mean (but then again, if you’re reading this blog you probably already know this stuff).